In 'Baby Driver,' The Action, The Script And The Music Go Full Throttle "This is a squealing-tires symphony that owes more to Jacques Tati ... than to Justin Lin or Michael Bay," says critic Chris Klimek. 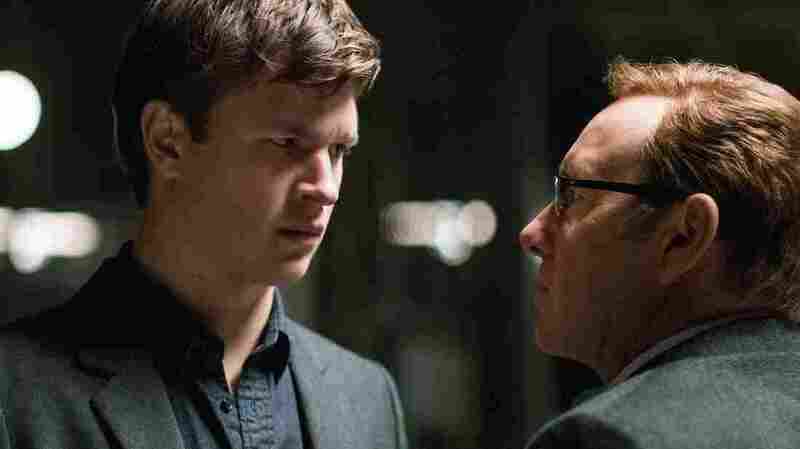 Baby (Ansel Elgort) looks dubious as Doc (Kevin Spacey) convinces him to do One! Last! Job! in Edgar Wright's Baby Driver. The director John Woo, whose filmography contains an aggregate body count in the quadruple digits, has frequently observed that action movies and musicals are close cousins. He's right about that, and I offer into evidence Edgar Wright's intoxicating new chase flick Baby Driver as Exhibit A. Also Exhibits D, E, G-flat and whatever other notes one might require to play the Jon Spencer Blues Explosion's "Bellbottoms," the first of many expertly curated soundtrack selections Wright uses to elevate his natty comic romance into a genre deconstruction that sings like Freddie Mercury and dances like Freddie Astaire. And burns enough rubber to make Vin Diesel's purely metaphorical hair stand on end. Baby Driver is a rush of a movie, is what I'm trying to convey to you. Walk or take public transit to the theater, as the urge to drive recklessly on your way home will likely prove overwhelming. This is a squealing-tires symphony that owes more to Jacques Tati, William Friedkin, Nicholas Winding Refn and Michael Mann than to Justin Lin or Michael Bay, channeling equal parts Heat and High Fidelity. It's supercharged with wit and visual invention even when its characters are just making sandwiches or doing laundry. The writing is sharp and fun ("That's Johnny No-Nose, formerly Johnny the Nose"), the performances vivid and dimensional, the pursuit sequences crisp with analog discipline. Like most of the soundtrack (save a new banger from Danger Mouse featuring Run the Jewels and Big Boi), it's defiantly old-school, but in the franchise-clogged summer multiplex it feels like the boldest, most original thing around. It's also overcaffeinated auteur Wright's first feature since his terrific dramedy The World's End four summers ago; in the interim, he signed on to make Ant-Man before finding the Marvelverse to be less creator-friendly than he'd hoped. (He retained screenplay and story credit on Ant-Man, which was ultimately directed by Peyton Reed.) He remains best known for his collaborations with writer-actor Simon Pegg; Baby Driver is the first of his five features on which he is the sole credited screenwriter. As Baby, 23-year-old Y.A. star Ansel Elgort brings that pacifist-tough-guy thing that the famous amateur racer Paul Newman possessed. He has no taste for violence but no fear of it, either. He plays a laconic wheelman in the employ of Atlanta crime boss Doc — Kevin Spacey, sucking in his Frank Underwood persona to give his most appealing performance in many years. This is the 20th-century Spacey, the one who always turned his supporting parts into something memorable; not the sweaty scenery-chewer he became after American Beauty. Anyway, Baby is the caretaker of his elderly, hearing-impaired foster dad (C.J. Jones), who makes known his disapproval of whatever it is Baby does to earn those fat stacks of bundled bills he hides under the floorboards. Baby wants out of his life of crime, but it takes a lot more than just two weeks' notice, as you know if you've ever seen a movie. Baby manages his chronic tinnitus by listening to music almost all the time, but certainly when he's working. Like the cat burglars in the immortal classic of the heist genre Hudson Hawk, [EDITOR'S NOTE: The preceding statement does not reflect the opinion of NPR] he times his extra-legal maneuvers to specific songs. He is never without his old-timey click-wheel iPod, the one that cost $499 in 2001 dollars, was the size of a cigarette pack and weighed as much as a baseball. He has others, of course, but his fealty to a device almost as old as he is is explained, though his preference for cassette tapes and micro-cassette recorders over digital devices never is. Nor are his superheroic reflexes, calm, and spatial reasoning behind the wheel. That's a choice by Wright, and it's the right one. Knowing when not to explain is an undervalued skill in storytelling. As in Drive, this is the kind of movie where we stay in the car while whatever violent business is happening inside the bank goes down. And as in Drive, Baby violates his code ofself-preservation by falling hard for a woman he barely knows. But Elgort and Lily James turn their diner meet-cute into its own pulse-quickening set piece. It's a bit of a letdown that Wright's otherwise boundless invention stops short of letting James do something more than act as a dewey-eyed hostage. The tatooed gallery of crooks Baby is forced to drive around includes Jamie Foxx, Jon Hamm, and Jon Bernthal, all first-rate actors who've sometimes seemed muted or just bored in genre flicks. Not here. Maybe they recognize the strength of what's on the page, or maybe Wright is just great with actors. (With the exception of Scott Pilgrim vs. the World, he's tended to work with his friends again and again, so it's hard to know.) Whatever the reason, they and Eiza González, who rounds out their crew, are all menacing and persuasive. In the movie's first big pursuit sequence, the one that shows us what Baby is made of behind the wheel, there's a shot of Hamm in the back seat, beaming at the thrill of riding along as his chauffeur leaves a fleet of police cruisers in the dust. He's not playing all that nice or good a guy, but in that moment, you'll know just how he feels.